Well, here it is. 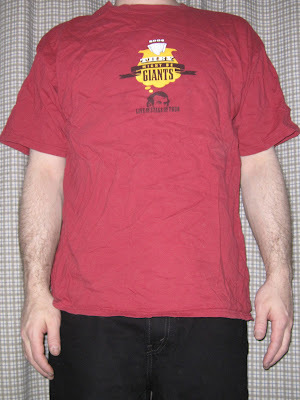 The final shirt. 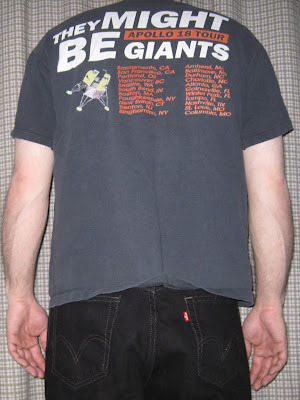 I guess when I started this I was not thinking about posting different versions of the same shirt in one entry, because I neglected to include the black version of my very first shirt, Hayseed Johns. But that's okay because it lends a kind of circularity to the whole thing. This blog is going to go on hiatus for a little while while I figure out what to do with it next. If you've enjoyed my t-shirt blog over the past fifteen and a half months, and/or you have an idea, I'd appreciate it if you would comment on this entry. 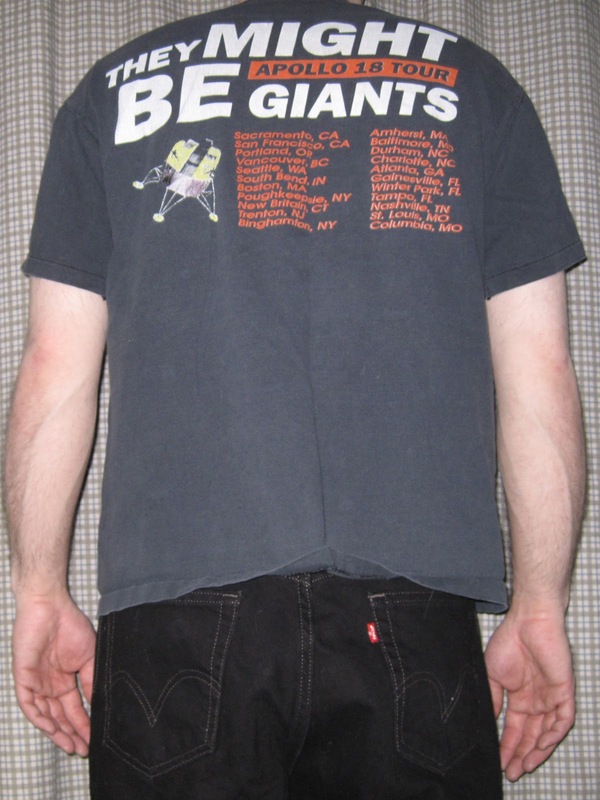 This one was acquired on eBay, and was worn by student security at Tufts University in Boston, MA on October 27, 1999. At the bottom is a quote from "How Can I Sing Like a Girl": "I want to raise my freak flag higher and higher.". Performed at Lupo's Heartbreak Hotel in Providence, RI on 3/9/12. 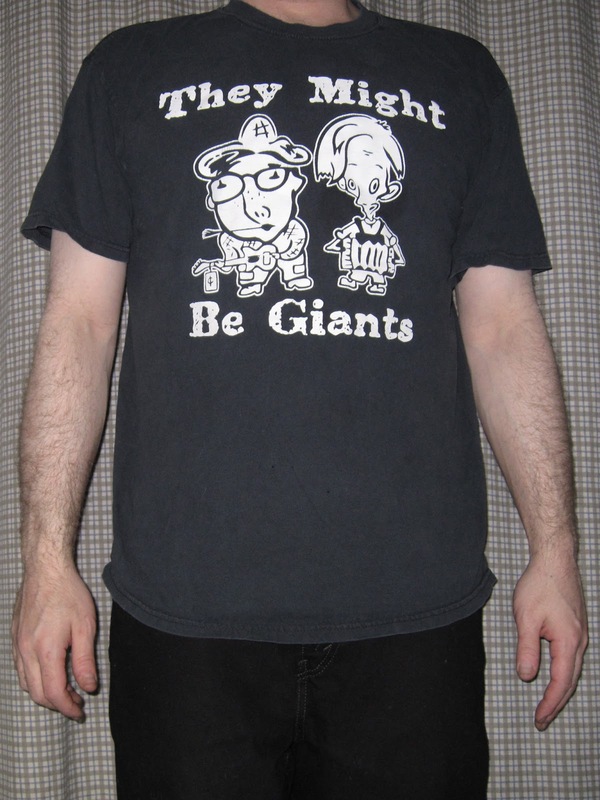 Not to be confused with "US Presidents", this tour shirt features Abraham Lincoln imagining They Might Be Giants Live on Stage on Tour. My shirt says '2002', and yet the "El Presidente on Red" that is currently available in the online merch store reads '2001'. Go figure.. 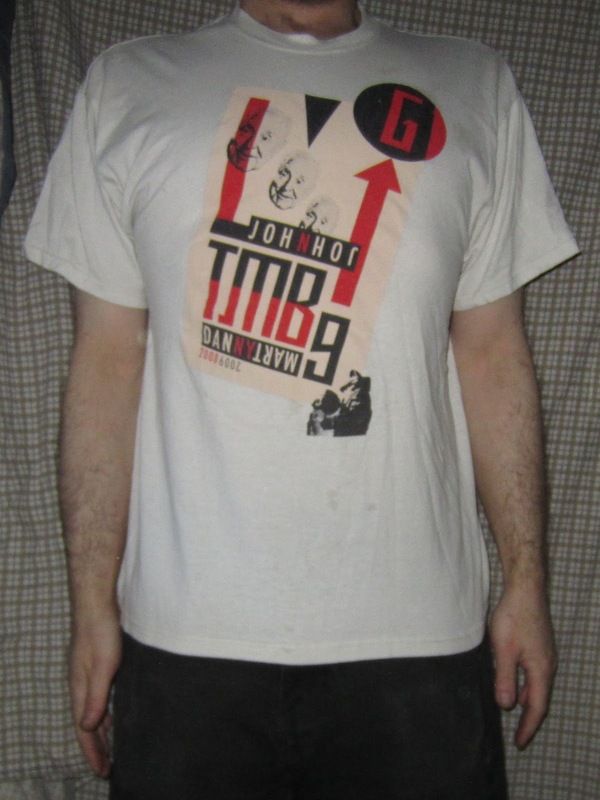 The back of the shirt pictures Richard Nixon being blinded by a TMBG banner above the Dial-a-Song number and website as well as their "Brooklyn's Ambassadors of Love" moniker. 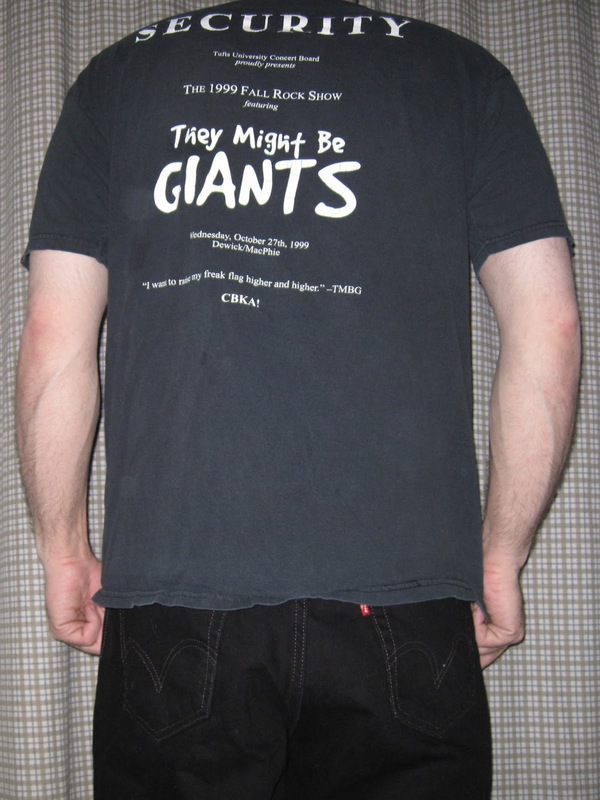 Last year, They Might Be Giants introduced the Instant Fan Club. 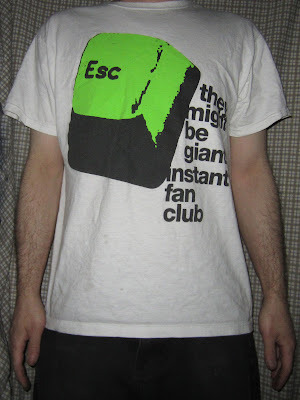 Included with membership was this lovely shirt with a Giant version of the IFC logo, featuring Paul Sahre's green escape key. 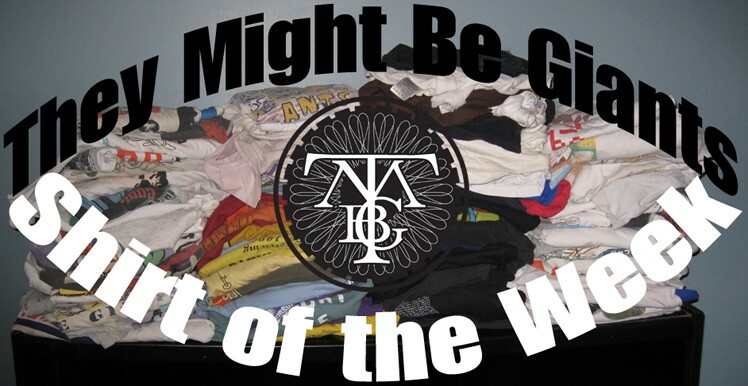 The TMBG Instant Fan Club 2012 edition is available right now. Included with this year's membership, among other fabulous things is a new version of the shirt with a blue escape key. There's even an option this year to order extra shirts for friends and family. Membership is limited, so be sure to Join Us soon before all the slots are filled! 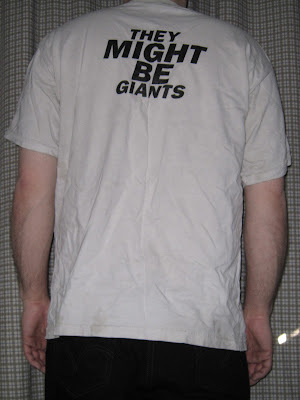 In honor of the 20th anniversary of They Might Be Giants' Apollo 18, which is today. 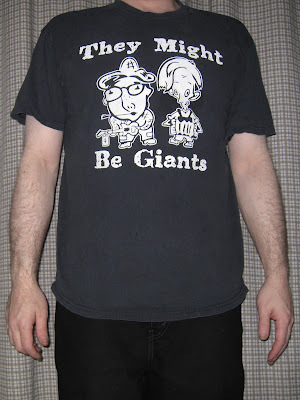 Just a few shirts left to show you, and I've been saving this one. 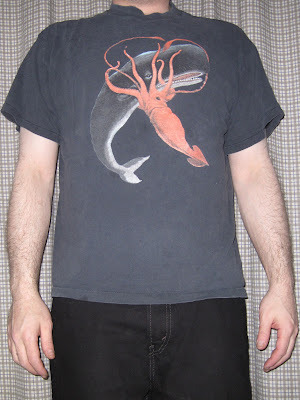 Happy Birthday, Whale & Squid Record! 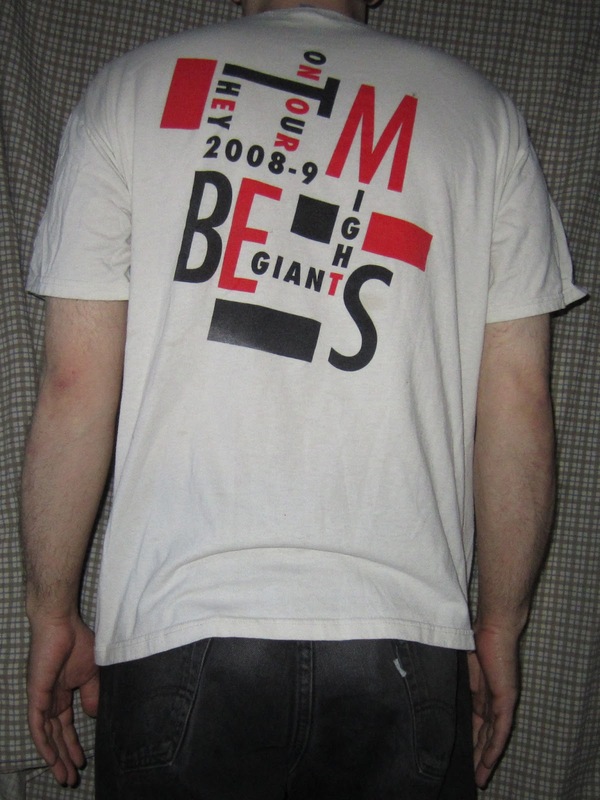 Here's the official album cover shirt. 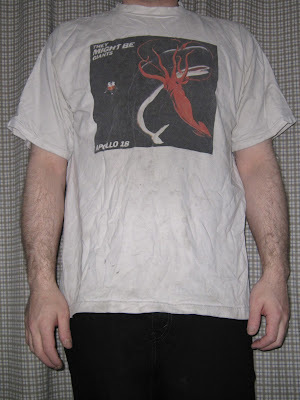 And here's the official Apollo 18 Tour Shirt, which I also own in white. 1992 tour stops and the NASA Lunar Lander adorn the back. This Apollo 18 staple was performed at Lupo's Heartbreak Hotel in Providence, RI on 3/9/12. I was not initially sure why this is called "1919". The only connection that I could find was that William Allen White is known for having reported from the Versailles Conference of 1919, and his face is predictably repeated thrice, mimicking their stage setup at the time. 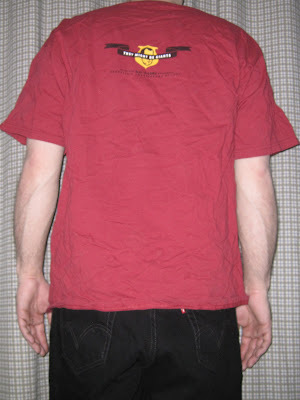 However, this investigator has learned that this shirt is a homage to a well-known 1919 lithographic Soviet propaganda poster called "Beat the Whites with the Red Wedge". This 2008-2009 tour shirt has a very interesting design. 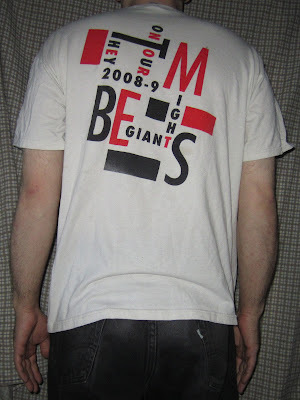 It features the first names of our five guys cleverly melded together into two pseudo-ambigrams consisting of the original duo and their backing band, with their common letters in red. It is also of note that highlighting the difference between "DAN" and "DANNY" produces "NY", which warrants no interpretation. *Sorry, I couldn't flip 'MART'. 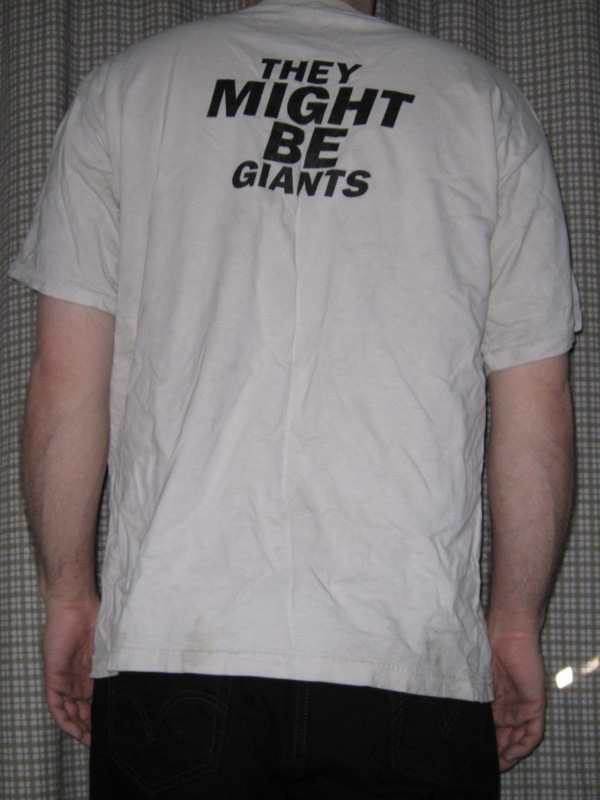 The back reads "They Might Be Giants on Tour 2008-9" in a charming crossword fashion. This shirt is available at the TMBG Merch Store under the name "1919 on Creme", though my shirt as well as what's pictured appear to be white. I suspect that it's an error caused by the subsequent availability of "1919 on Creme Fine Jersey Slim Fit" t-shirt for women that actually does appear to have a creme hue. Performed at the Calvin Theatre in Northampton, MA on 3/8/12, featuring the new "cacophony of sound" opening.